Reserve your visit directly from our website today! 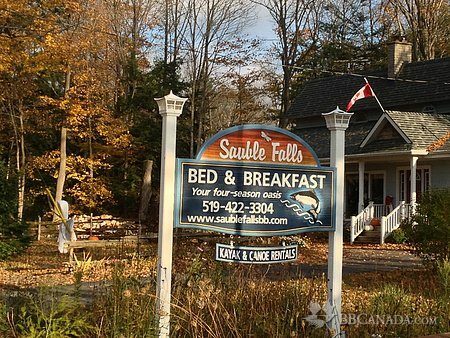 Relaxing setting on the Sauble River just upstream from the beautiful Sauble Falls; enjoy the view from every room. English/French/Spanish + some Portuguese spoken! 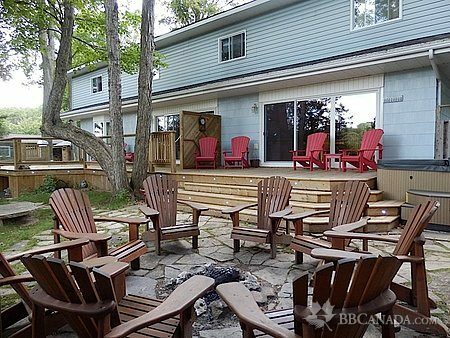 Featuring outdoor 8-person Beachcomber hot tub (Closed 3rd week of June to Labour Day), complimentary WiFi and seasonal Canoe/Kayak/SUP rentals from our private dock: April-November. Guest-only lounge with gas fireplace, Guest fridge, spacious, comfortable Guest rooms (bathrooms have heated ceramic floors for off-season comfort), summer evening campfire. 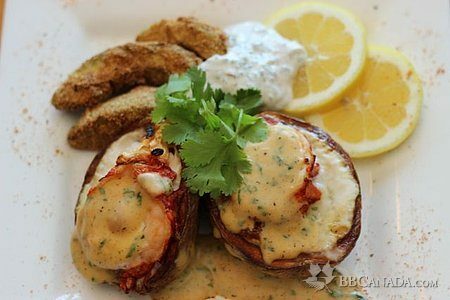 Full gourmet breakfasts - Douglas is a professional chef! 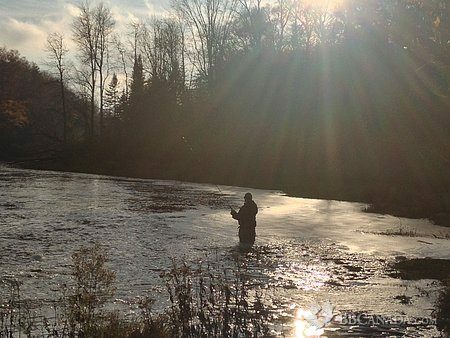 Seasonal Activities: hike, bike, swim, golf, geocache, canoe/kayak/SUP, fish, hunt, stargaze, bird watch, x-country ski, snowshoe & snowmobile trails. Rejuvenate yourself in our hot tub in the evening (Sept-mid-June). Check In/Check Out : Check-in after 4:00 pm; Check-out before 11:00 am. (Note: Early/late check-in/out by arrangement only; please call us. Extra hourly fee will be incurred in most cases as we are a 'two-person show'. Thanks for your understanding and cooperation. Cancellation : Deposit by credit card of first night per room booked; All changes and cancellations subject to an administrative fee of $28.25 for each room booked. Please see website for complete details. Seasonal Information : Open all year as your four-season oasis! Reserved for Guests 8 years older unless booking all four rooms. Delicious meal plans available. Hot tub open from mid-September to mid-June. From April to November. Canoe,Kayak,Standup Paddleboards onsite!